No, not really me. Just my namesake. Every time I come across the panels below, from Daredevil #77 (by Gerry Conway and Gene Colan), I remind myself that I should do a post about this little nugget from the archives. Apparently, in the wake of Karen’s recent move to Los Angeles, Matt had been dating a woman named Christine between issues. Now, she has stood him up (see, I’d never do that), and this fact enters into Matt’s monologue about all the things that are wrong in his life. 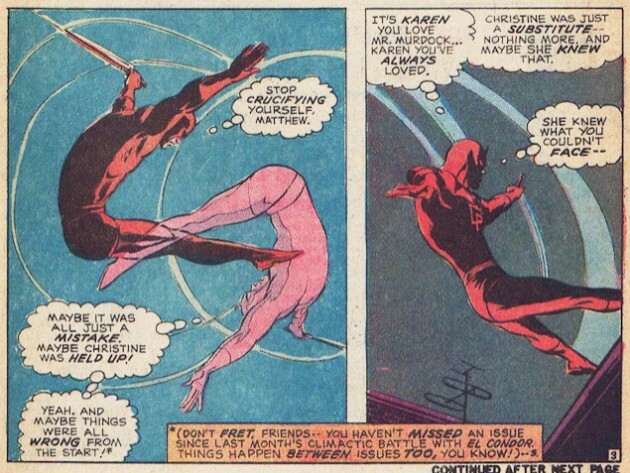 The early issues of Gerry Conway’s run, which began with Daredevil #72, was initially quite a roller-coaster in terms of Matt’s emotional state, so the “woe is me” going on above was pretty much par for the course for a while. Perhaps this is something to get back to in a future post. Newsarama has a new interview with Mike Allred, who will be the artist for Daredevil #17, due out in August. So, go read that! Also, there was quite a bit of enthusiasm for my previous post about Matt’s hair, and someone even suggested I do a post about his glasses over the years (seriously, you guys are as weird as I am). I do take post requests, so consider that one officially on its way! In the mean time, I suggest my post from two years ago about Matt’s sense of fashion for those of you who crave more of the mundane details of our hero’s life. Okay guys, that’s it for now. Have a great weekend! And thanks for taking my odd request. I like how already back then there was the catholic/Christian theme. I mean he is talking about crucifying him self. Maybe I’m reading to much between the lines.